No one likes to go bald. Most people don't like to think that something about them caused it. So balding men come up with all kinds of explanations for why it is happening. They aren't eating right. Their hair follicles are all clogged from their shampoo. Their blood doesn't circulate well on the scalp. Their mom's dad was bald. Except for the last one, these are all bogus. And the last one is only partially true. Baldness happens because of the genes people inherit from both their mom and dad. Some studies show that 80% of balding is genetic. A key gene can come from a maternal grandpa. But this gene doesn't explain all baldness. People are just as likely to be bald if their dad or their maternal grandfather is bald. Two new studies have fingered a small region on chromosome 20 called 20p11 as being associated with balding. This sort of thing could explain people who are bald even though their mom's dad still has a full head of hair. Scientists don't know how this DNA is involved or even what part is involved. All they know is that people who are bald tend to have a certain version of 20p11. One study found that having this DNA could increase a man's chances of going bald up to 4 times. If men also have certain versions of another gene, then the odds go up as high as 7 times. The other study found a different bit of 20p11 was involved. They concluded from their study that the increased risk was as high as 3 times. These two bits of DNA are pretty close together and are probably pointing to the same part of chromosome 20 as being important. Unfortunately neither group found out why these bits of DNA increase someone's risk for hair loss. There aren't even any genes close by. So obviously there is still a lot of work to be done. In the meantime, scientists might be able to use these findings as a way to look for treatments to give men before they go bald. The idea would be to screen people who are likely to go bald and to find treatments for them. Perhaps medicines that can prevent balding are easier to discover than those that can cure it. Once researchers figure out how chromosome 20 is involved in balding, scientists might be able to use that information to come up with new balding treatments. One can only hope. At first it might seem weird that researchers found a bit of DNA involved in baldness but that they can't figure out why it is involved. The reason for this has to do with the way people find DNA involved in disease. Human DNA is a long string of 3 billion letters (or bases). Each human is unique because these letters are arranged in a certain order*. These differences or SNPs (single nucleotide polymorphisms) work like landmarks to help scientists find which part of the DNA to focus on. They are like clues on a treasure map. The first part in using a treasure map is narrowing down what part of the world the treasure is in. Imagine the map shows that the treasure is in San Francisco. Then there might be clues that the treasure is near a certain hill or near an oddly shaped tree. Perhaps the treasure is buried near the tower on Mt. Sutro. With this information, the treasure seekers can get digging. If they know a treasure is in San Francisco, they can't just dig up the whole city. But if they know it is near the tower on Mt. Sutro, then they can dig all over that area. This is how DNA searches work too. 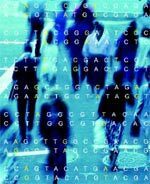 Scientists use SNPs as landmarks to narrow down DNA regions to focus on. Instead of a treasure map, scientists use the HapMap. They use this map to compare the DNA of people with and without the condition they are interested in. In these studies, scientists compared the DNA of balding and not balding men. The first study looked at German men. One experiment in this study compared 296 balding men to 347 German men and women who were not seriously bald. The researchers looked at over 500,000 different spots on their DNA and found that bald people shared a number of landmarks in a 1.7 million base chunk of chromosome 20. They had narrowed it down to San Francisco. More clues led them to a single letter difference that was shared by many of the balding men. A second experiment looked at 319 bald men and compared them to 234 men who weren't bald by the age of 60. This second experiment confirmed the results of the first one. The second study was done similarly. They compared 578 Swiss men with male pattern baldness to 547 Swiss men who weren't balding. They found a different SNP near the one the first study found. They confirmed that this DNA difference as associated with baldness in over 3000 other individuals from a variety of Northern European countries. So these two studies have narrowed down where the "treasure" is. They made it to Mt. Sutro. They know that something on a small section of chromosome 20 is partly responsible for balding in Northern European men. The next steps will be to do some serious digging and to find the treasure. In other words, the researchers need to figure out what in this region is causing these men to bald early. And once they do that, they need to find out why these men go bald. With that information, they might be able to create medicines that can treat baldness. Usually there is a gene nearby that researchers can investigate. In this case, there isn't. The SNPs are in the middle of nowhere with the nearest gene being at least 350,000 bases away. So researchers have their work cut out for them. In doing these studies, the researchers also rediscovered the DNA difference that men can inherit from their mom's dad that can lead to early balding. *The exception is identical twins who have essentially the same DNA but are still unique for environmental reasons. Back in 2005, researchers did a similar study on, again, balding German men. They found a DNA difference on the X chromosome that was associated with going bald. This finding fits very well with the idea that baldness can come from someone's maternal grandfather. Because each son has a 50-50 shot of getting an X from their maternal grandpa through their mom. 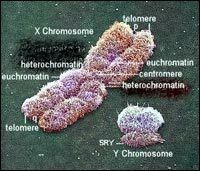 The X and the Y chromosome determine whether someone will be a boy or a girl. If someone has two X chromosomes, then she is almost always female. And if someone has an X and a Y chromosome, then he is almost always male. What this means is that a daughter always gets dad's X chromosome and a son always gets dad's Y chromosome. This is why dad determines the gender of the child. Imagine that someone has a maternal grandfather who is balding. He will give his "balding" X to his daughters. They probably won't go bald because they have an extra X chromosome from mom. The daughters will pass this "balding" X down to their sons half of the time. Researchers found a piece of the X chromosome that tended to be shared in balding men. They were able to narrow down the region on the X chromsome to a single gene -- the androgen receptor (AR) gene. This gene definitely makes sense as being involved in balding. One effective balding treatment is a medicine called Propecia. Propecia works by affecting how the androgen receptor works. When the researchers studied the AR gene, they found that balding men often had a different version than men who kept their hair. So they were able to finally find the treasure. Hopefully the new studies will find out why chromosome 20 is involved in balding too. Then we will have a more complete story of baldness. And maybe new treatments too. is on the X chromosome.